This document explains what AT commands are, and how they can be used to issue direct commands to the baseband processor of a smartphone. AT commands have been introduced in 1981 as a way to control a wired Internet modem by software. In these times, a modem was basically a device with two input/output ports. One (A) connected to a computer, and the other (B) connected to the telephone network (see Figure 1). A typical data exchange in such a setup looks as follows: the computer sends a piece of information as digital data over line A, the modem transforms it to an analog signal by modulating a carrier signal, which it sends out over line B to the telephone network. Similarly, when the modem receives an analog signal from the telephone network over line B, it transforms it to digital data by demodulating it, and forwards the digital data to the computer over line A. Figure 1: Manual modem configuration before the introduction of AT commands. Before AT commands existed, what flowed through the lines A and B was exclusively data. Any modem management tasks, such as for example setting the phone number to dial, were done manually, directly on the modem (Figure 1). The novelty introduced by the AT command architecture was that it allowed to send such instructions (the AT commands) to the modem over line A from the computer (Figure 2). AT commands are plaintext strings that typically start with the two letters AT (meaning “attention”), hence the name. Figure 2: Automatic modem configuration with AT commands. This approach requires the modem to know whether any bits it receives over line A are meant to be interpreted as data or as instructions. To this end, the architecture defines two modes that a modem can be in: data mode and command mode. In data mode (the default), the modem interprets anything received over line A as data to send to the telephone network, and processes it as usual. In command mode, however, it interprets anything received over line A as AT commands, and consequently executes them. To switch the modem from data mode to command mode, the computer can send the special escape sequence “+++<pause>” over line A to the modem (three plaintext plus signs, followed by a pause of around one second). In turn, to switch the modem from command mode back to data mode, the computer can send the AT command “O” to the modem. AT commands have been standardised in 1995 in the ITU-T Recommendation V.250 entitled “Serial Asynchronous Automatic Dialling and Control”. Today’s smartphones contain two different processors, a baseband processor (BP) and an application processor (AP). Figure 3 depicts this fundamental architecture. The BP contains the implementation of the radio-related functionality for the different cellular networks (i.e. GSM, UMTS, and LTE, as defined by the 3GPP standards). The logic running on the BP is often called the “modem”. Cellular network BPs are produced by only some few manufacturers, such as Qualcomm, Infineon, Broadcom, or MediaTek, that, by law, must be licensed to implement these network technologies. The modem implementations are furthermore kept strictly secret . The AP, on the other hand, is a general purpose processor that may run an arbitrary operating system and arbitrary user functions. It is in fact the AP that makes a phone a smartphone: early mobile phones, that could not do much more than making calls and sending and receiving SMS (i.e. functions as defined by 3GPP standards), had only a single processor, the BP. As with time new general-purpose functionality has been added to mobile phones, at some point an additional general-purpose processor to accommodate these functions was introduced, the AP. The presence of an AP, in addition to the BP, can be seen as the distinguishing feature of smartphones, with respect to old-fashioned “non-smartphones” . 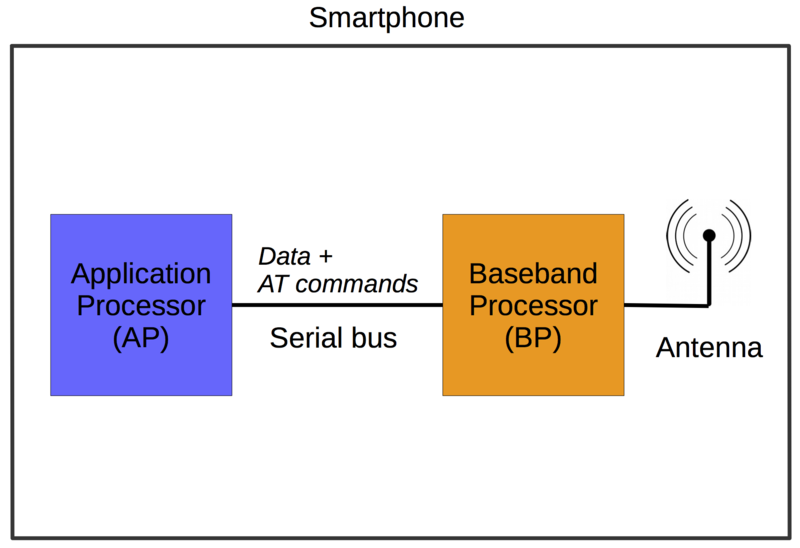 Figure 3: General smartphone architecture including a dedicated application processor (AP) and baseband processor (BP). Interestingly, for the communication between the software running on the AP and the modem implementation on the BP, the AT commands paradigm, that was known from wired telephone modems (see Section [sec_at_commands]), has been retained. In particular, the AP and BP are connected by a single serial line (often USB), and the user functions on the AP control the modem on the BP by AT commands issued over this line (see Figure 3). A possible reason for the retention of AT commands in mobile phones might be that it has been standardised before, and thus provides a clear interface for the modem implementation (which in turn is a blackbox even for the phone manufacturers, thus no customisation is possible ). The use of AT commands for cellular network modems requires a different set of commands than for traditional wired telephone modems. Therefore, the set of AT commands for telephone modems as standardised in ITU-T V.250 has been expanded, and in 1999 standardised by 3GPP in 3GPP TS 27.007 entitled “AT Command Set for User Equipment (UE)”. Figure 4 shows for the specific case of an Android phone, how the AP-side communicates with the modem implementation running on the BP, as well as a possible hook for allowing a custom communication with the modem. In the following, the elements of Figure 4 are explained. Figure 4: Normal communication between the Android framework and the modem (green), and possible hook for manually communicating with the modem (red). First of all, the software running on the AP is made up by two main parts, the Android application framework and the Linux kernel (the Linux kernel used for Android devices is a customised version of the original Linux kernel). These two parts are the main ingredients of what commonly is referred to as “Android”. The module of the Android application framework that gathers all telephony-related (GSM/UMTS/LTE) functions is the telephony manager. This module can be accessed by application programmers through the API TelephonyManager. The telephony manager communicates with a separate user-space process called RILD. RILD stands for radio interface layer daemon, and it is an integral part of Android. The RILD in turn talks to the so-called vendor RILD. The vendor RILD is provided by the manufacturer of the modem implementation (i.e. the BP manufacturer), and it is thus a hardware-dependent counterpart to the more generic RILD. The vendor RILD in turn communicates with the driver of the concrete modem implementation that is running on the BP. This communication takes place in the form of AT commands (as mentioned for the general smartphone architecture in Section [sec_smartphone_arch]). The modem driver exposes an interface in the form of a device file, as it is a common practice in UNIX systems. This device file is /dev/smd0. In practice, this means that writing to the file /dev/smd0 results in the passing of messages to the modem driver, and reading from the file coincides with obtaining messages from the modem driver. The modem driver, finally, communicates over the serial bus connecting BP and AP with the modem implementation on the BP. 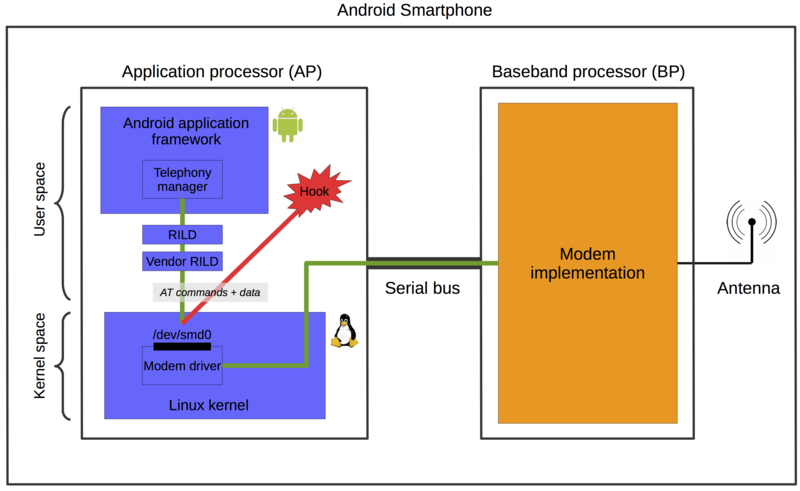 In Figure 4, the path taken by any communication between the Android application framework and the modem is indicated in green. Indicated in red, in Figure 4, is the possible hook that allows to communicate with the modem without going neither through the Android application framework, nor through the RILD or vendor RILD. Such a hook simply directly talks to the modem driver (and thus the modem itself) by writing and reading AT commands and data to and from the modem driver’s device file /dev/smd0. Once such a hook is in place and working, it is possible to build on it. For example, it can be wrapped into a stand-alone Linux process, which then in turn can be accessed by an application running in the Android application framework. In this way, the modem can be controlled, or information from the modem can be obtained, conveniently from an ordinary Android application. There exist several working examples of this approach. For example in this article, a hook as described above is used to inject incoming “fake” SMS into the AP-side of an Android smartphone. In particular, the modem driver interface (through the file /dev/smd0) is manipulated such that it is possible to make it look for the vendor RILD and RILD, and thus ultimately for the Android application framework, as if an SMS is received. However, in reality, this is not a real SMS received over the air by the modem. The goal of this work is to be able to “receive” SMS (from the point of view of the Android application framework) in order to test Android’s SMS handling implementation, without the need to send real, and costly, SMS over the operator network (the source code of this work can be found here). Another working example of this approach can be found in . In this case, the goal is simply to monitor the communication between the RILD components and the modem driver. I tried to apply the approach described in the previous section to a Motorola Nexus 6 phone running Android 6.0 build MRA58K. The Nexus 6 contains a Qualcomm MDM9625M baseband processor. There exist reports of similar problems, and also indications that it might depend on the Linux kernel of the used Android version (for example, here). Thus, trying with different phone models and/or and Android versions might eventually lead to success.